Grind And Shine: Metal Chocolates : The Record The adventurous duo's sound moves from hip-hop to radio theater to house. Metal Chocolates: OC Notes on the left, Rik Rude on the right. All week Ann Powers and The Seattle Times' Andrew Matson are having coffee with people in Seattle's fertile rap scene. We're calling the series Grind and Shine, and you can read the interviews and see portraits here. ARTISTS: Another day, another downloadable bundle of songs from Seattle's OC Notes (Otis Calvin, III). The 25-year-old producer/singer/rapper is Seattle's combination Madlib and Mos Def. Such reductive comparisons don't do him justice — but will get you within rock-throwing distance of his woozy style, which moves fluidly from hip-hop to radio theater to house music. It's all soul music to Notes, who pumps it out from his underground studio in Seattle's OK Hotel, at the downtown edge of the city, next to the ocean. He has put out three albums this year, including standout work with MC Rik Rude (Ricky Reams, also in popular synth-rap group Fresh Espresso) — a psychedelic hip-hop project called Metal Chocolates. Rik is as stream-of-consciousness with his rhymes as Notes is with his beats — apparently, anyway; it could all be more composed than we know. In Seattle, high school students and recent grads apprentice themselves to Notes. MCs try and fail to freestyle alongside Rik. 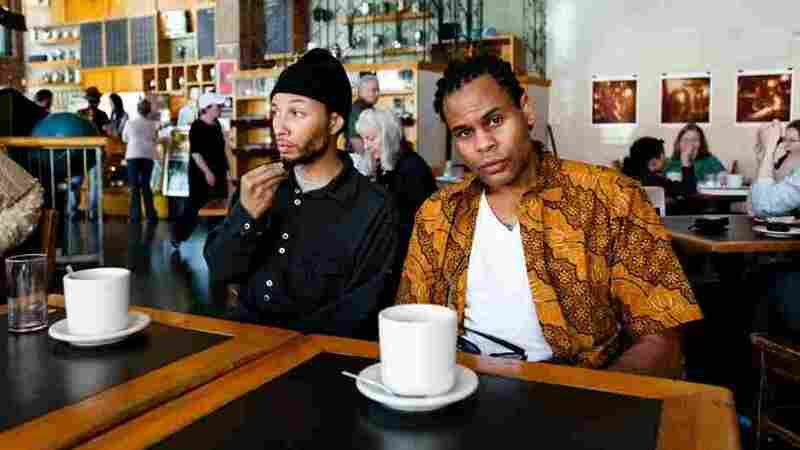 Metal Chocolates might fit next to the spaced-out vibe of locals Shabazz Palaces and THEESatisfaction, but is its own thing, starry-eyed while rooted to the anxiety of Pioneer Square and its bustling drug and alcohol casualties. Zeitgeist Coffee in Pioneer Square is right near the old King Street train station — the right spot to meet one of Seattle's most adventurous new hip-hop projects. These guys travel: their sound touches upon syrupy Southern rap, electronica, jazz, psychedelica, even world music. Imagistic and inspired, Metal Chocolates leans easily against the cutting edge of urban music; they're Odd Future without the hate, or The Weeknd with a better sense of humor. Plus, they're sweet guys. We sat down with them for the third interview in our Grind and Shine series. ANN POWERS: Neither of you were born in Seattle. RIK RUDE: I'm Michigan born and raised, but I'm kind of a nomad. What's kept me in Seattle is the art scene, working with great artists. There have been times when I've contemplated moving to the U.K. or even South America. But I stayed, and I'm happy that I did, because I feel like I'm working with some of the best. OC Notes! Right now Seattle is getting a lot of attention for its music — and it's great — but at the same time there's a lot of people who want to keep it all about the art. OC NOTES: I grew up in a military family, and then my parents split up, so I feel like I've never been from anywhere. This is home — this is the place where I've spent the most collective time — but I don't really feel like I have a home. ANN POWERS: When did you two start working together? RIK RUDE: It had to be 5 years ago. You were 19, bro. He's one of the true first cats I met here. I lived in this horrible apartment and I just had stuff cluttered everywhere. I'd moved out here from the Bay Area, on a whim, not knowing what I was gonna do one day to the next. I brought this guy into the crib, like, 'Man, I heard you do beats. I do rhymes, you should check out my stuff.' The first thing he said to me was, 'Rik, man, this rap stuff is cool, but I want to start a circus. I want to do something crazy.' Seriously, this dude's a visionary. ANN POWERS: How did your collaboration evolve into this current project, Metal Chocolates? OC NOTES: I guess it's new because we dropped it, but it's old because we made it a long time ago. RIK RUDE: Really Metal Chocolates is just the name of the record. We roll collectively as Rude Notes. Under that moniker there are several projects. Otis released an awesome house record called Dap Confuser, I'm on a few songs. And we've got more stuff in the works. It's not old or new, it's timeless. ANN POWERS: Otis, you went to music school in Arizona for a while. Why train professionally? OC NOTES: I always wanted to go to college and then my life got all weird with family s--- and I just wasn't able to go to college. Then my grandfather got cancer. I went to Phoenix to go be with him. While I was down there, a friend said, 'Go to this school,' and it just so happened to be a school I'd looked at when I was 15 or 16. It's one of the best recording schools in the country — the Conservatory of Recording Arts and Sciences. It's like, ill gear, and you have 24-hour access to the studio. And it's in Phoenix, which is a good city to get your grind on. I learned the science of sound — literally how sound works. There are certain things I used to do that were making my final output terrible. Learning a few little things changed the game massively. Signal flow, how machines work, how audio processes through certain devices. I would have never thought of it, but that stuff helps. ANDREW MATSON: Is your studio in the OK Hotel building tricked out? OC NOTES: No, It's hella hood. It's like a project studio, more for creation. We call it "the lab." ANDREW MATSON: You have a song called "Pioneer Square Powder," sort of in honor of the neighborhood. ANDREW MATSON: Pioneer Square has been historically grimy. It's Seattle's Skid Row. OC NOTES: You can't really build around it. [Those people] ain't got nowhere to go! RIK RUDE: I feel that it's the artist's responsibility to talk about what is around them. Music has gotten to a point where we just want to discuss only the things that we choose to see, but the ugly stuff needs to be mentioned. Often, that's where artfulness comes in. ANN POWERS: Whether you're talking about real or imaginary places, your rhymes and beats are very imaginative. RIK RUDE: We see visuals first, often. We pride ourselves on working with visual artists. Artists have created paintings inspired by our music. ANN POWERS: You should collaborate with Fleet Foxes. OC NOTES: I don't know what that is. RIK RUDE: It's this indie rock stuff, kind of country. ANDREW MATSON: Probably the biggest band out of Seattle right now. OC NOTES: Wow. I gotta type that into Google. ANN POWERS: Do you think about working with other kinds of musicians? OC NOTES: We did a show with [post-rock/electronica outfit] Sleepy Eyes of Death and it was cracking! All the people they brought really enjoyed our show. And I was totally blown away by what they were doing. That's exactly what I want to do. I don't want to do a show that's like, Metal Chocolates and all the rest of those [rappers] you've already seen. That's why I like going to festivals so much. I want to get a taste of everything. And go home sweaty! ANN POWERS: Rik, you work with the white rapper and producer P Smoov of Mad Rad in your duo Fresh Espresso. RIK RUDE: We don't care about genres. We care about making the right frequencies. At the end of the day it's all frequencies. If the white boys are doing it filthy, we're going to work with them. ANN POWERS: Breaking down barriers one person at a time. RIK RUDE: I was born in Flint, I was in Oakland, I'm in Seattle. I live in Ballard, it's a predominately Norwegian neighborhood. But I bring my own flair. It's like, 'What's up?' I'm here. I'm a traveling man, and I will bring my sense of community everywhere.